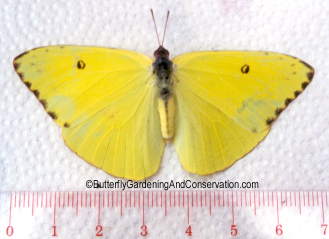 Cloudless Sulfur with wings open. 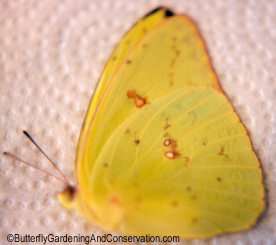 The Cloudless Sulfur is a yellow butterfly that spends its winters in the southern US and migrates to the northe in the summer. Its wingspan can reach as much as 7 cm. 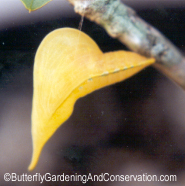 It is commonly seen flying in the southeast direction in the fall. Host plants include Senna/Cassia marilandica (Wild Senna) and Cassia fasciculata (Partridge Pea) as well as Cassia bicapsularis, nicititans, occidentalis and obtusifolia. 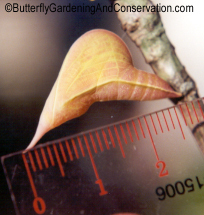 Eggs are cream colored and laid singly on host plant leaves and flower buds. 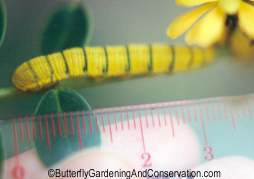 According to Scott the larva/caterpillars eat the leaves of the host plant, however the one in the pictures below ate only flower buds, there was no evidence of any leaves on the plant having been eaten at all. 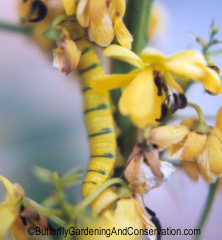 This 5th instar caterpillar was found on a Senna/Cassia marilandica (Wild Senna) plant, eating flower buds. It blended in very well with the flowers and was hard to see. 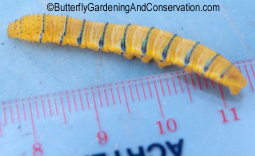 This is the same caterpillar as above but with a ruler near by to help with size perspective. It pupated within 24 hours of finding it and taking these pictures. This is the same chrysalis as the picture on the left, but at a later time. It developed a pinkish coloration after a few days.